The last post about Byzantine Istanbul involved the Column of Constantine, and Constantine the Great had a huge role in shaping the city that took his name. 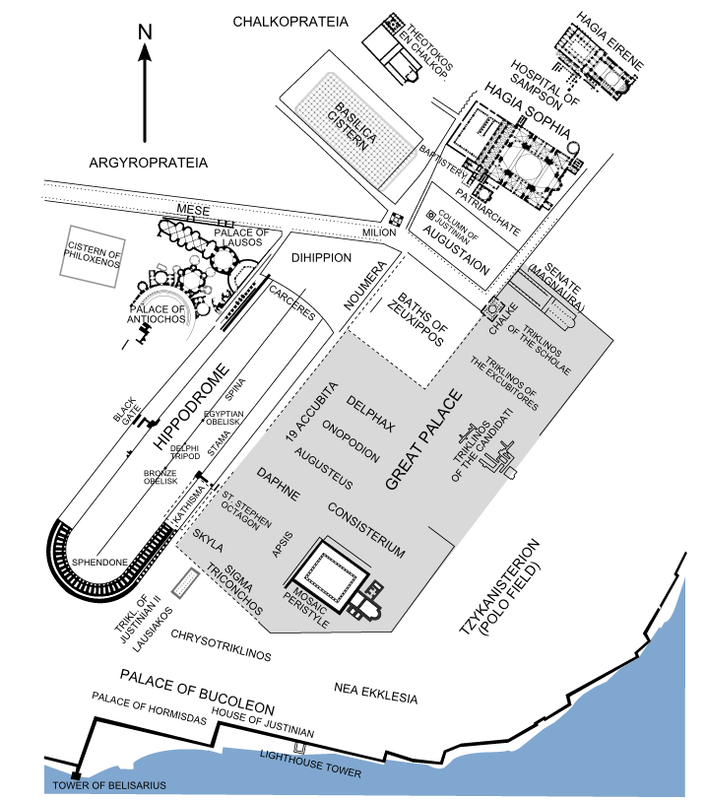 One of Constantine’s major building projects was the Great Palace, which he had built in the early 4th century when he moved the capital of his empire from Rome to New Rome. Still, to call it “a palace” is to downplay its history and evolution. Its history begins before Constantinople was an imperial capital, it involves Persian kings, Roman Emperors, Greek Basileis, Crusader Kings, and Turkish Sultans. It was built, added to, expanded, left to decay, and built upon. These days it is largely obscured by later Turkish building, but archaeologists are still finding remnants. But for nearly 1000 years, it was the “Great Palace,” and the seat of empires for centuries. What is left of the palace? There are some structural remnants of the palace complex itself, in which I am including the Bukoleon Palace which sat “next door.” These, its various artifacts on display in places such as the Istanbul Archaeological Museums, and a fuller treatment of the palace complex itself will require another post. Today, I would like to write about the mosaics that have been uncovered from the Great Palace, which now largely reside in the Great Palace Mosaic Museum. The complex was situated in the southeast corner of the peninsula, and it occupied the entirety of the space occupied by Sultanahmet Mosque (the “Blue Mosque”) today, and more. 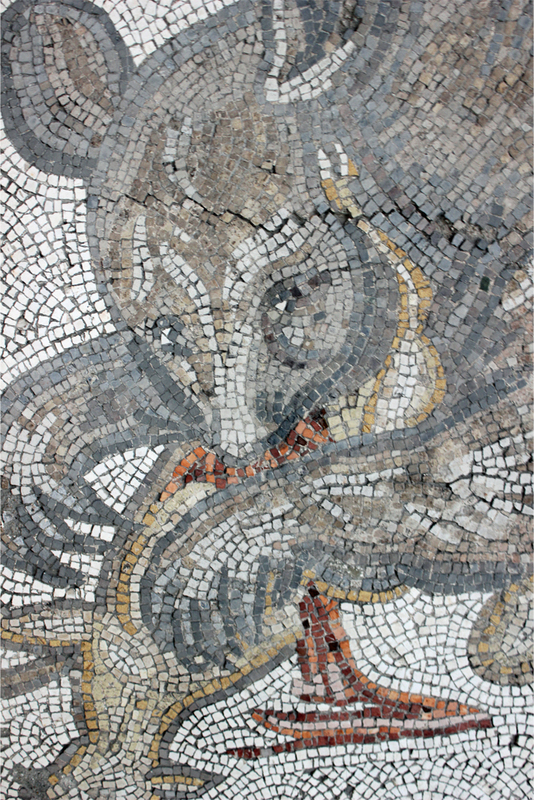 While the Great Palace was destroyed and then built over, archaeologists in the 1930s uncovered a part of the palace complex that comprised a mosaic-covered peristyle that sat underneath an outdoor bazaar near the southern corner of Sultanahmet. While the palace generally, and the peristyle in particular, went through renovations and changes over the years, the mosaics, emplaced during the reign of Justinian, remain to this day. What happened to the peristyle? In an effort to preserve its cultural heritage – something that modern Turkey is much better at than Ottoman Turkey – a museum was built to house the peristyle. To me, the best part of this museum is that the peristyle is extensively preserved in situ. I will never complain about seeing amazing artifacts in museums; however, there is something about seeing them in the place that they originally stood (or laid) that makes the experience that much more interesting. 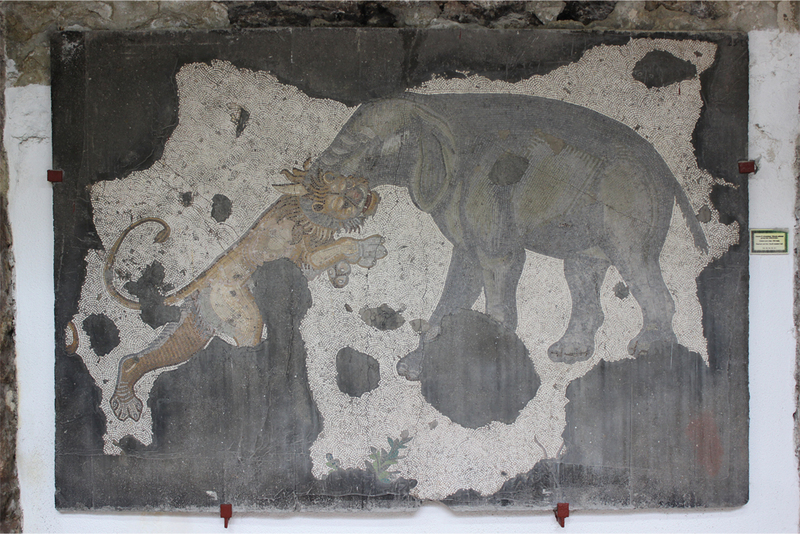 Some mosaics have been recovered from elsewhere in the peristyle and hang as if in an art gallery, but as much as they could, the archaeologists preserved the mosaic floor of the peristyle as it was. The result is a small, but incredible, museum. 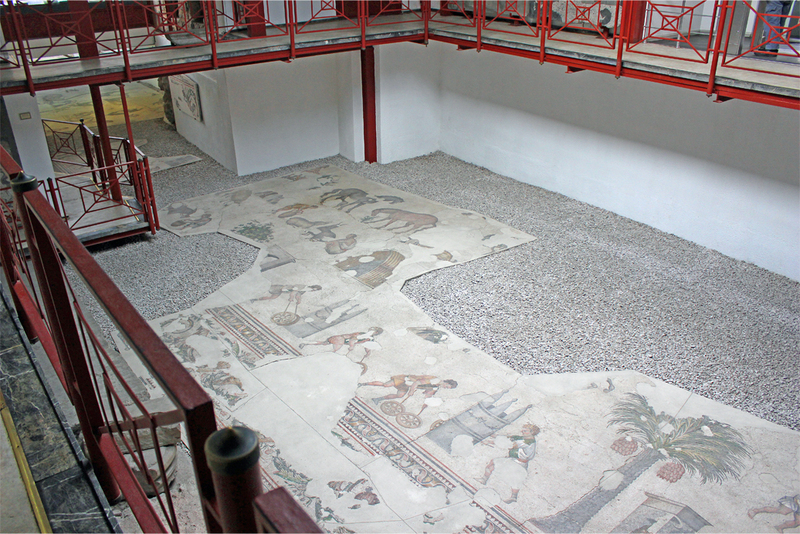 The museum itself is small, including floor mosaics of about 250 square meters, or about 2700 square feet. But archaeologists estimate that only one-seventh to one-eighth of the floor remains. To put that into perspective, we are talking about nearly half an acre of mosaic flooring. That’s something like an area from the 50 yard line to the goal line on an American football field. Archaeologists have suggested that it may have taken 80 million tesserae, the small, square tiles of limestone, glass, and ceramic that make up the mosaics. Think about that. If one tessera was laid every single second, around the clock, every day of the year, it would still take about two and a half years to lay them all down. Thankfully, Justinian had quite the team of skilled workers. What mosaics can be seen? 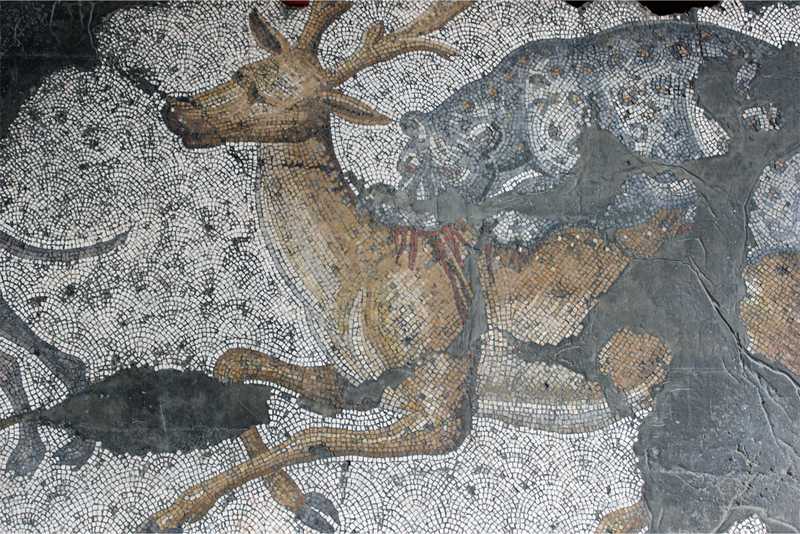 Of the 250 square meters of surviving mosaics, some 180 square meters remain in situ, comprising a large panel of four horizontally-oriented strips of scenes. Around the surviving edges is 1.5 meter-wide border of botanical shapes. The scenes are largely wildlife-oriented: there is quite a lot of hunting, and there are some bucolic scenes, and some of rural life. The hunting scenes in particular are striking, as the artists did not shy away from blood and gore. Such scenes also include animals fighting one another, such as an elephant locked in combat with a lion, a marten with a small animal in its jaws, and big cats taking graphic bites out of prone gazelles. 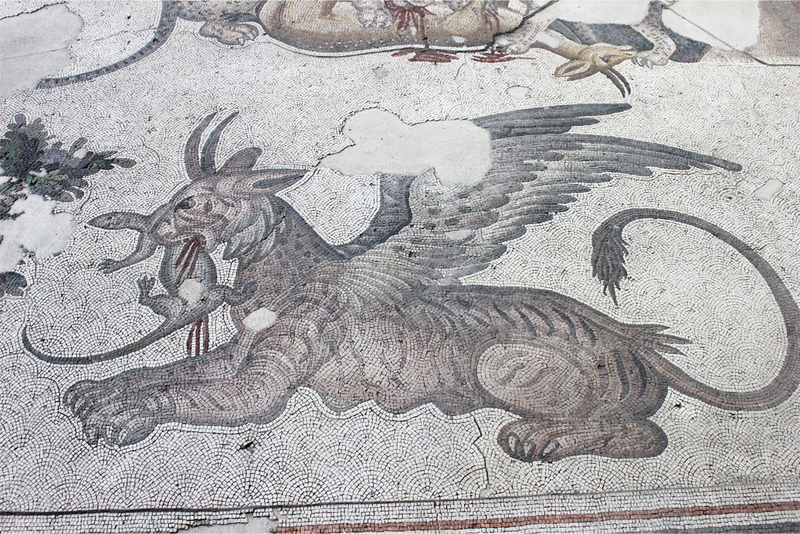 There are also some scenes from mythology, including an exquisitely preserved and very large griffin that was among my favorites. Should I go to the museum? If you are visiting Istanbul, and you are worried about seeing everything, you may wonder if this museum is worth your time. I think it is. First of all, entrance is included in the useful Muzuemkart (museum pass). It is also quite close – just steps away – from Sultanahmet Mosque, which you are probably visiting anyway. And finally, given its diminutive size relative to its neighbors, you can visit in a very reasonable amount of time. We lingered a bit, but a Chinese tour group came in after us and were in and out in ten minutes tops, including at least eight minutes for selfies and pictures with the peace sign. Even better, notwithstanding this one group, we had the place mostly to ourselves for at least half our time there. I would strongly suggest you check out this overlooked gem of Byzantine history on your visit. so interesting! keep ’em coming! Very neat! I didnt get to see this, nor did I know about it but it is very similar to a museum we went to in Hatay (south eastern tip), a brand new archaeological museum which has quite a number of these inlaid mosaics, (i understood similarly that the museum was built upon a site so some of them were also in the original place). Funny side note, when I uploaded my pictures to facebook, the automatic face detection was trying to tag a number of my friends as some of the people and animals in the mosaics. Ha! The face detection fail is hilarious. And that museum in Hatay sounds amazing!